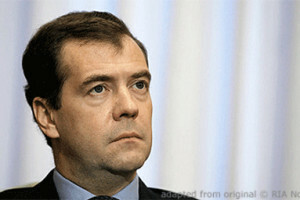 Dmitry Medvedev attended a plenary session titled Future of the Legal Profession. The St Petersburg International Legal Forum was launched in 2011 and is a major platform for dialogue between politicians, lawyers, economists and researchers representing all the main economic and legal systems. The forum seeks to promote ways to modernise the law in the changing global environment, including ways to optimise cooperation between legal systems and work out common approaches to developing law in today’s world, to modernise Russian law by using the best international practices for drafting and administering laws, and to assist in the development of modern legal sciences and legal education in Russia and throughout the world. The forum’s agenda this year focuses on the latest developments in the legal world, changes in international and Russian law, as well as international cooperation. The theme of the plenary session is Future of the Legal Profession. The award ceremony of the of the St Petersburg International Legal Forum Private Law Prize 2018 was held for the first time on the sidelines of the event. This law prize, which has no analogues either in Russia or in the world, was established in 2017. The award recognises the laureate’s high academic profile. The world’s top-ranking universities were given the right to propose candidates for the prize. Based on publicly available academic rankings, a list of leading law schools and R&D centres was drawn up and 82 deans of legal departments on five continents received invitations to nominate academic works. Among the criteria for awarding the prize was the international significance of the nominated work. The award’s expert council included world-class legal scholars who are trend setters in today’s legal research and whose works inspired several generations of legal experts. The forum expands its audience every year, attracting more and more legal experts from across the world. Our forum is unique in that it brings together representatives from various sectors of the legal profession. This year, more than 4,000 people from 90 countries are attending the forum. Many are those watching live broadcasts online. What are the main tasks that the legal professionals will have to face, whether they want to or not? Protecting individual rights is essential. This is an absolute priority for any legal system. This vision is set out in the Russian Constitution, which marks its 25th anniversary in 2018. This celebration coincides with another anniversary: 20 years ago, Russia ratified the European Convention for the Protection of Human Rights and Fundamental Freedoms. These two instruments have become part of our legal system, our legislative and judicial practice, ultimately changing the lives of so many people. Tomorrow a conference will open in Denmark where a declaration on the long-term vision for the European Convention is expected to be adopted. Together with 46 countries of the Council of Europe, Russia took an active part in drafting this instrument. We support it, as we support the subsidiary nature of the ECHR with respect to the legal systems of member states. We share the view that the European Court of Human Rights must take into consideration the general provisions of international public law. The very purpose of law enforcement agencies and the state in general is to protect human rights to enhance legal protections in Russia. To this effect, the Ministry of Justice drafted a concept for regulating professional legal assistance. It includes, among other things, a proposal to compel all legal experts to abide by professional standards and assume responsibility for their actions. These changes are sure to affect the work of foreign law firms operating in Russia. They will also have to follow these single requirements when providing legal services in Russia. These legislative changes will be implemented in stages in order to enable both legal professionals and their clients to adapt to them. Preserving public trust in the law is the second essential task for the legal system. This will be impossible if disputes cannot be resolved in a just and impartial manner. Today, the three methods of issuing orders, authorisations and interdictions we have all become used to no longer work. In any case, it is hard to ban anything or enforce any bans in the digital environment or on global markets. Mandatory economic regulation has its limits, while the costs of these approaches are sometimes higher than the effect expected by lawmakers. Today’s law must become more risk-driven. There is a possibility to stimulate certain activities, offering convenient and beneficial models, while maintaining freedom of action. This is the way we worked to provide guarantees to investors, including the arbitration law reform. This effort was completed at the end of 2017. A professional arbitration system was created in Russia in keeping with global practices. We were able to get rid of a number of unfair arbitration centres, corporate courts and “puppet” arbitration courts. At the same time, we created effective mechanisms for protecting entrepreneurs’ rights. The Russian Government is working on a draft law to make it easier for recognised foreign arbitration institutions to obtain the right to administer disputes in Russia. Trust in the law is only possible if legal subjects respect and observe it on the national, supra-national and international levels. In this area we believe that there are serious issues. On the one hand, businesses face a unified set of requirements in many countries. On the other hand, any more or less significant corporation operating in foreign markets is subject to cross-border regulation. These businesses have to take into consideration laws of various jurisdictions, the so-called soft law and recommendations issued by international watchdogs. We are seeing more groundless extra-territorial restrictions based on intentionally falsified evidence, or fake news. Businesses are blacklisted without due process. This is not even a matter of politics, since such acts are mostly driven by the desire to get rid of the competition, under the cover-up of massive media attacks. You have all heard about the doping scandals and accusations against Russian athletes. Some of these cases were referred to arbitration and challenged in court. The Court of Arbitration for Sport in Lausanne overturned lifetime bans in 39 cases involving Russian athletes. Russian athletes filed lawsuits to protect their honour and dignity in other jurisdictions as well. At the same time, some officials from sports associations can be heard saying that in certain cases the presumption of innocence does not fully apply to athletes, while a court that abides by this principle should be reformed. This shows the urgency of ensuring the quality of international justice. We need international tribunals to be consistent and free from double standards. We need effective judicial protection based on universal principles of procedure: the adversarial principle and the principle of equality of parties, evidence credibility and wholeness principles, independence and candour of judges. The third major goal for the legal community is to adapt legal regulations governing entire economic sectors to digital technologies. We are seeing the arrival of previously unknown, and occasionally obscure, aspects of law, and methods of investing in digital projects. Blockchain, which is taking cross-border financial transactions to a new level, is spreading. Two draft laws are being put together in our country that deal with digital technologies in the financial sphere, with the understanding that the rouble is and will remain our country’s only legal payment instrument in the future. Transactions in the digital environment are a reality which we can no longer ignore. We need to incorporate basic provisions in civil law and translate them into the language of law. The new regulation in this sphere will help provide judicial protection against abuse in the event of disputes, prevent the withdrawal of assets into an uncontrolled digital environment, and also create the basis for building a taxation system for such systems. On the other hand, the attempt to regulate everything in the digital world is counterproductive and unrealistic. We need to come up with new legal positions that protect the rights of developers and investors, and take into account the interests of businessmen and service consumers. Autonomous vehicles are one such area today. Russian automaker giants and IT companies which engage in developing machine learning methods are coming up with their versions of autonomous vehicles. Already this year, we will hold a full-scale test of technologies and infrastructure for unmanned vehicle traffic. To support this area of research, the Government needs to adopt a package of requisite acts. We will continue to create the “regulatory sandboxes,” that is, experimental zones to test the latest legal developments and legal regulation. In Russia, we already have advanced development zones operating under a special legal regime, including the free port of Vladivostok. Very soon, we plan to create special regions with special legal status and tax regulations in the Primorye Territory and the Kaliningrad Region, and also on Russky Island and Oktyabrsky Island. We consider the opportunities that are opening in supranational associations to be even more promising. We are working closely with our EAEU partners, including on the digital agenda. Digital technologies are coming to the judicial sphere as well. Starting last year, it has become possible to file electronic documents with federal courts of general jurisdiction in Russia. About 130,000 users have registered with the dedicated website. Over the past year, more than 200,000 procedural appeals to courts of general jurisdiction were filed electronically, and over 300,000 were filed electronically to arbitration courts, where the testing of this system began a little earlier. As part of the programme to promote the digital economy, we provided for the training of lawyers in this area. We plan to start such training next year. In the long run, the young people will be the ones to take up these new challenges. They are the future of the legal profession. Today, what we need is not merely a mechanical amount of knowledge, but also legal intuition and a sense of law. We must learn to look at the law as a whole through the prism of a variety of disciplines that are sometimes not completely related to law. This is difficult and calls for better training. This year, a Russian student team was the winner in the Willem C. Vis International Commercial Arbitration Moot court competition for the first time. I am confident that this will not be our last victory.